The Problem: Current smaller format 3-D printers are limited in their functionality and process controls to allow them to be as efficient as possible while producing the highest quality product. By integrating the Edison® board into our custom built printer we can now address limitations that current manufacturers of the printer are not addressing. The Edison board allows us to now integrate multiple process controls over a single platform. This allows us to add additional components to the system that can greatly increase performance and quality. The traditional line diagram for a printer looks like this, which is also what ours looked like until today. By adding the Edison we can now integrate additional fans, temperature sensors and motor controls that will allow us to program control protocols in the software making it possible to create a very user friendly device that produces a consistent and high quality product seamlessly. Edison essentially has allowed us to make a “smart” 3-D printer with a more dynamic mind which allows us to greatly expand the capabilities of the user. Edison allows for massive scalability, which makes the evolution of this technology unlimited. Now process functions can be mapped and optimized. Motors, temperature and application speed can be calibrated based upon the application and controlled within the code which can constantly evolve. Devices can now be programmed with protocols that allow for precise optimization of controls. By utilizing Edison even functions unforeseen today have room to be added on in the future. With the Intel Edison 3D printer data can be collected. This data can be stored in Microsoft Windows & SQL Azure. We can also begin to predict better and faster prints. By connecting 3D printing to the cloud the limits are endless sending 3D models to our friends and families printers. It has been our team's pleasure to introduce Edison to 3-D Printing. Rapid development could have only been achieved using JetBrains Python tools! Programming 110 electrical volt power relays. # Copyright (c) 2014 Intel Corporation. Intel board support for running C# using Mono. Web based 3D software. OctoPrint provides a responsive web interface for controlling a 3D printer (RepRap, Ultimaker, ...). It is Free Software and released under the GNU Affero General Public License V3. Lots of hardware setup scripts. From Bash, Wifi, useful links, sample code, developer setup and complete Debian Linux image. Galileo is previous generation many examples apply to the Edison. 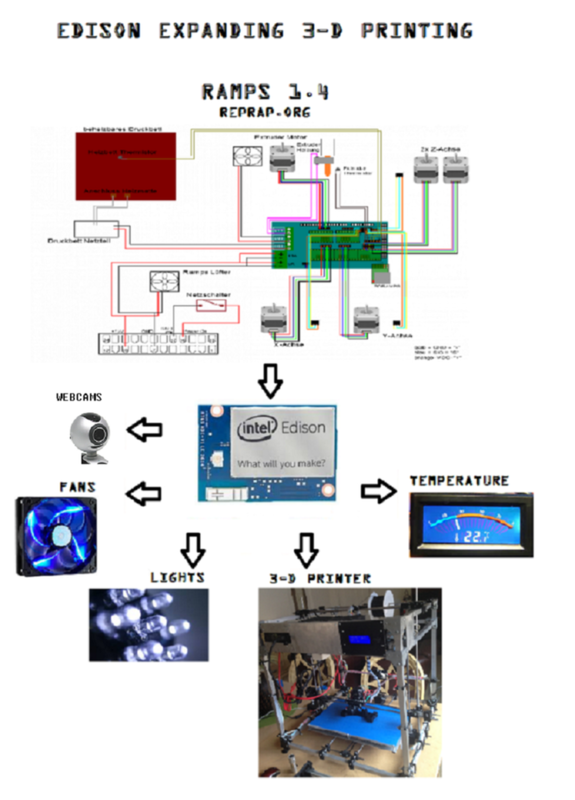 Repository will soon have more examples relating to the Intel Edison. Marlin configuration supporting RepRap 3D printers with working auto bed leveling. Repository has Configuration.h settings used for the 3D printer used at HacksterIO show. Marlin 3D Printer Firmware Marlin has a GPL license because I believe in open development. Please do not use this code in products (3D printers, CNC etc) that are closed source or are crippled by a patent. Quick Information This RepRap firmware is a mashup between Sprinter, grbl and many original parts. Derived from Sprinter and Grbl by Erik van der Zalm. Sprinters lead developers are Kliment and caru. Grbls lead developer is Simen Svale Skogsrud. Sonney Jeon (Chamnit) improved some parts of grbl A fork by bkubicek for the Ultimaker was merged, and further development was aided by him. Some features have been added by: Lampmaker, Bradley Feldman, and others... Features: Interrupt based movement with real linear acceleration High steprate Look ahead (Keep the speed high when possible. High cornering speed) Interrupt based temperature protection preliminary support for Matthew Roberts advance algorithm For more info see: http://reprap.org/pipermail/reprap-dev/2011-May/003323.html Full endstop support SD Card support SD Card folders (works in pronterface) SD Card autostart support LCD support (ideally 20x4) LCD menu system for autonomous SD card printing, controlled by an click-encoder. EEPROM storage of e.g. max-velocity, max-acceleration, and similar variables many small but handy things originating from bkubicek's fork. Arc support Temperature oversampling Dynamic Temperature setpointing aka "AutoTemp" Support for QTMarlin, a very beta GUI for PID-tuning and velocity-acceleration testing. https://github.com/bkubicek/QTMarlin Endstop trigger reporting to the host software. Updated sdcardlib Heater power reporting. Useful for PID monitoring. PID tuning CoreXY kinematics (www.corexy.com/theory.html) Delta kinematics Dual X-carriage support for multiple extruder systems Configurable serial port to support connection of wireless adaptors. Automatic operation of extruder/cold-end cooling fans based on nozzle temperature RC Servo Support, specify angle or duration for continuous rotation servos. Bed Auto Leveling. The default baudrate is 250000. This baudrate has less jitter and hence errors than the usual 115200 baud, but is less supported by drivers and host-environments. Complete source code published on github. Reprap Wilson, 3D printer design Published under GPL v3 This is my reprap printer design, a derivative from Josef Prusa's i3 with the following goals: Replace the waterjet metal frame / wooden box frame with an inexpensive and rigid frame made from standard 2020 Aluminum Extrusion. To make the build volume parametric (easy to scale up or down by 50%), with a parametric BOM tool (spreedsheet) to assist in part selection. To simplify construction of the printer by reducing vitamins and including detailed assembly steps as part of the design files. I've made an effort to reduce the number of unique parts (nuts & bolts) as much as possible. I've also incorporated single-piece Y ends that eliminate about 20 more hardware items. The repository has these parts: The STL files needed to build the printer. Documentation section where instructions and parts-list can be found. Some parts have corresponding OpenSCAD models which are kept in the scad folder. Various images of the printer/build process are in the images folder (beneath docs). Phoenix 3D Printing Meetup This group is for anyone interested in 3D printing. Both novices and experienced printers are welcome. I am a teacher librarian, interested in makerspaces. I love the idea of communities pooling resources to create new ideas and inventions.